The International Fusion Materials Irradiation Facility (IFMIF) is one of the projects stemming from the Broader Approach Agreement, a partnership in fusion energy research between Europe and Japan. IFMIF is an accelerator-based neutron source that produces, using deuterium-lithium nuclear reactions, a large neutron flux similar to that expected at the first wall of a fusion reactor. Two important milestones have recently been achieved at the Linear IFMIF Prototype Accelerator (LIPAc): the accomplishment of the first hydrogen plasma in the ionisation chamber and the first extraction of an ion beam (H+). In the case of LIPAC, the Japanese Atomic Energy Agency (JAEA) has been responsible for the procurement of the conventional systems, such as the accelerator building, the secondary cooling system, and the machine and personnel protection system. Europe’s contribution, coordinated by Fusion for Energy (F4E), has been delivered by the European countries voluntarily contributing to the BA. The LIPAC injector has been developed and manufactured by France’s Commissariat à l’Énergie Atomique et aux Énergies Alternatives (CEA) Saclay. It has been successfully installed in Rokkasho, Japan, and is now under commissioning. 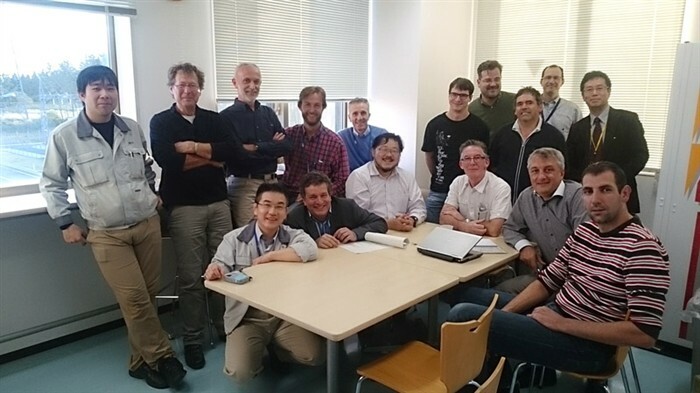 The achievement of the first plasma and beam extraction has been an important achievement for the LIPAc team, including participating experts from France’s CEA, led by Raphael Gobin. After the accomplishment of the widely anticipated first plasma, extensively reported in Japanese media, within only two days, further commissioning allowed a proton beam of 100 keV and 100 mA to be obtained. The prospects are now excellent to reach the target of extracting a current of 140 mA of 100 keV D+ ions in the forthcoming commissioning phase with deuterium.